Your Roth IRA needs solid stocks like Cisco Systems, Waste Management, and Adobe Systems that can grow substantially over time. Roth IRAs are among the greatest investment tools available to build and secure your retirement nest egg, simply because you don't have to pay Uncle Sam any taxes on your withdrawals. For example, if you add some stocks to your Roth IRA today and find yourself sitting on solid gains years down the line -- courtesy of stock appreciation and dividends -- they'll be all yours to enjoy tax free. Of course, you can't just throw any stocks into your Roth IRA if you really want to benefit. They must be ones with strong upside potential for the long haul, just like Cisco Systems (NASDAQ:CSCO), Waste Management (NYSE:WM), and Adobe Systems (NASDAQ:ADBE), as our contributors explain below. Keith Noonan (Cisco Systems): Cisco stock has a long list of characteristics that make it one of the best stocks you can buy for your Roth IRA. Chief among them are its dominant position in networking, growth potential in emerging technologies, rock-solid balance sheet, and inexpensive valuation. Factor in an attractive dividend component, and these qualities combine to make it a comparatively low-risk stock that has the potential to generate substantial returned income and capital gains. Of course, low risk doesn't mean no risk, and it's worth pointing out that the company's core routing and switching businesses are facing pressure from rivals and the broader trend of hardware functions being replicated through virtualization. However, the routing and switching businesses are still huge cash generators, and Cisco's push into software and services is helping to diversify the company. On the dividend side of things, Cisco recently announced an 11.5% payout increase, and the stock's yield sits at an attractive 3.5%. Adding dividend-paying stocks to a retirement account can be a good way to reduce your overall risk profile. There's also the very important benefit of future dividends and reinvestments being tax free. Trading at roughly 14 times forward earnings estimates, Cisco stock looks inexpensive compared to the networking and communications average of 25, and the company's valuation looks even better in the context of its sizable balance sheet. Neha Chamaria (Waste Management): The methods of managing waste might change over the years, but we'll almost always need someone to haul, dispose, and recycle all the waste that's generated. That's what makes Waste Management such a compelling buy-and-hold stock -- the kind you want to have in your Roth IRA. As North America's leading waste-management company with an incredibly well-developed landfill and recycling network, Waste Management already has an enviable footing in this defensive, capital-intensive industry. What matters is the amount of money the company is making out of handling trash. 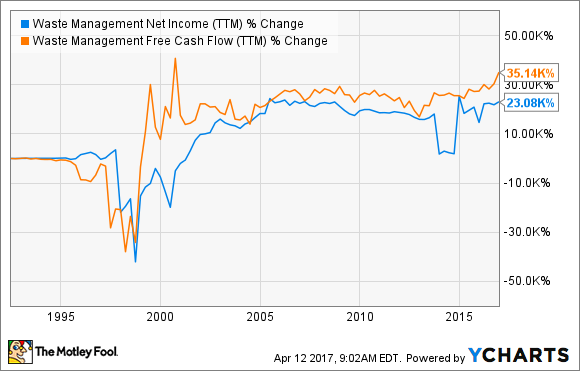 Check for yourself how Waste Management's profits and free cash flow have grown over the decades. WM Net Income (TTM) data by YCharts. The stock, including dividends, has more than doubled in just the past five years. In fact, its dividends make Waste Management an even stronger contender for a retirement account. That's because the dividends you receive on your stocks in a Roth IRA also grow tax free. Waste Management has increased its dividend every year since 2004, growing it at an annual compounded clip of 6.7% since then -- so all those reinvested dividends also end up as tax-free gains in your retirement account. Waste Management's dividend yield of 2.3% might not be enticing, but there's nothing better than owning a stock that offers both capital appreciation and dividend upside potential in your Roth IRA. Tim Brugger (Adobe): There are few better alternatives for a Roth IRA than Adobe Systems. Adobe isn't likely to "wow" investors with 50% year-over-year revenue gains -- though last quarter's 22% jump in sales, to $1.68 billion, is nothing to sneeze at. What long-term shareholders will enjoy, however, are reliable increases on both the top and bottom lines. Adobe was initially criticized when it made the decision to shift from the traditional approach of relying on new sales to drive growth to instead focus solely on an annual recurring revenue (ARR) model. Subscription sales of Adobe's creative, marketing, and document clouds form the basis for its ARR, and it's working like a charm. Last quarter, Adobe reported $4.25 billion in ARR for the trailing 12 months. To put that into perspective, last year, Adobe generated a total of $5.84 billion in sales. Total revenue is sure to climb this year, but ARR continues to make up a larger portion of sales. Not only does ongoing subscription sales growth translate to a stable revenue foundation that investors can bank on, but it simply costs less to service existing customers than relying solely on generating new sales. Adobe's fiscal 2017 first quarter was another example of the ancillary benefits of an ARR model. As mentioned, sales climbed 22% -- but Adobe didn't need to spend to drive those results. Operating expenses increased by a mere 11%, or half its revenue growth. For long-term Roth IRA investors, Adobe stock warrants strong consideration.